The town of Frisco was founded in 1873, and incorporated in 1879. It is unclear when the cemetery was established, but most agree that it has been the town's burial grounds for over 100 years. It is a working cemetery, owned and operated by the town. The small cemetery has a naturalistic area, and more park-like areas. There are many unmarked graves, and some graves marked simply with a granite marker labeled "unknown." In 1951, the cemetery itself faced a minor bit of drama, as a newcomer to the town bought the ranch on the east side of the cemetery. The newcomer, Emil Slovak, discovered that his land extended into the cemetery grounds by about 1/2 an acre. Slovak was hired as a school teacher in Frisco, and convinced he was in the right, but lacking in tact, he built a fence through the cemetery and put up "No Trespassing" signs. The townsfolk were understandably upset. A group stormed the fence, and tore it and the signs down. The case went to court, and Slovak lost. Soon after, he sold the land and left town. The new buyer left the cemetery alone. *Excluded from the listing below are the markers of people without death dates, assuming that they are still living. 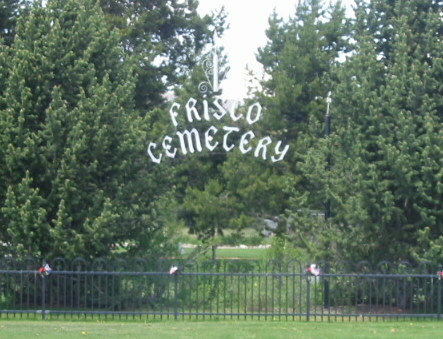 View a Google Earth Gallery of Frisco Cemetery.